We’ve been to plenty of restaurants before they open, but few of them seem to haunt us like Mill Street Bar + Table has. We somehow knew, from the moment we entered to talk about drinks before they opened, that this place would be trouble for us . . . especially since it’s 3 minutes from our house. Our blogger-senses were tingling so we finally headed down on an early Saturday night a couple weeks after opening to finally dig in. And boy, did we dig in, consuming over 12 dishes and 6 different drinks . . . shared with another couple of course. Even WE can’t eat THAT much food. Well, with all those dishes and cocktails, where do we start? Let’s go with the Raw Bar . . .
Up first were 8 grilled oysters, enough for two each. You can order as few or as many as you want, but we’re sure glad we didn’t order just one each because that’s how damn good they were. In fact, these oysters were some of the best that we’ve ever had . . . and Kristien has had MANY. Chef Lazlo actually had talked to us a bit about them, saying that they’re grilled just a tiny bit so that they’re still super juicy. On top was a buttery sauce with a nice white wine touch. Really, we couldn’t get enough of these. From there it was hard to decide what other seafood to get because there were so many options. Clams, lobster rolls, salads, shellfish platters, caviar, two crudo options, and, yes, more oysters. 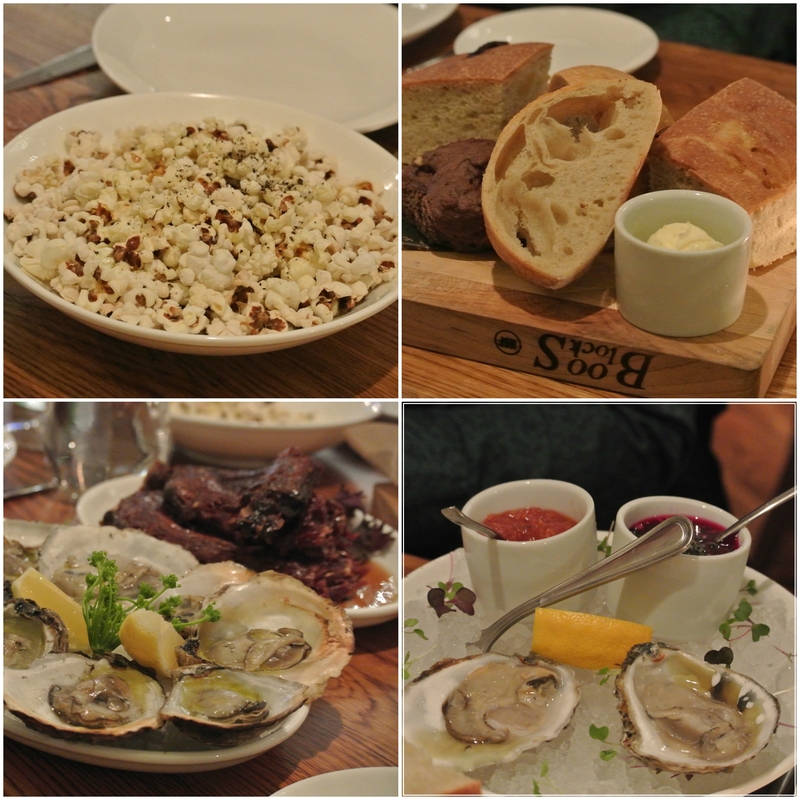 The thing that interested us the most were the Stella Mar Oysters, harvested from the waters of Greenwich. Who knew? What was interesting here was they were served with two sauces: the typical cocktail sauce and a unique mignonette sauce earthified with beet puree. There was a brininess to the Stella Mar that we liked and it balanced nicely with the Mignonette sauce. And, if you’re ever just in the mood for some oysters or other raw seafood and a drink, you can get all that from the actual Raw Bar, or the bar, or even the lounge. While we were eating all that great, fresh seafood, we got our drinks: three of us had ordered Grilled Margarita cocktails while our friend Jen tried out the Cantaloupe cocktail. The Grilled Margarita had a nice sweetness to it with the right balance of liquor. We like how the grilled lime added a little bit of smokiness, too. It was a very refreshing margarita and, while we liked it, we didn’t think it was anything too special like we’ve experienced at other restaurants. We really liked the Cantaloupe Cocktail, though, for its light, floral, cantaloupey flavors. What we also liked is how the Prosecco added a nice fizziness to the finish. 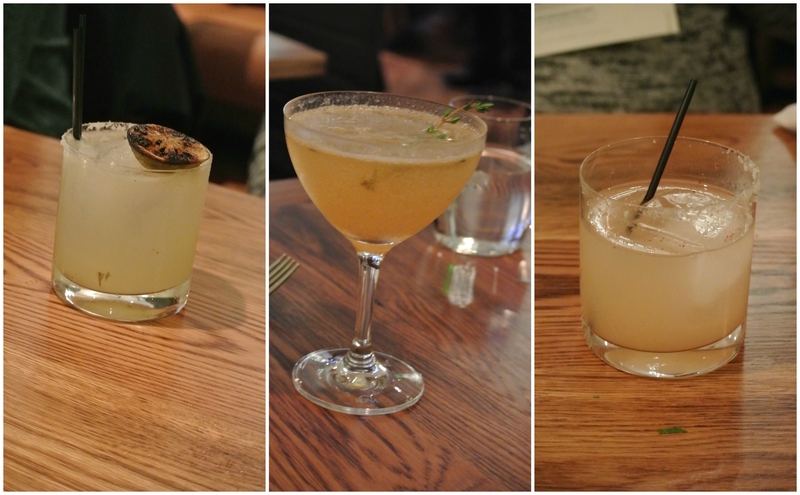 Later we also had the Byram River Daisy, made with Byram River Rum (made in Port Chester), lime, and Green Chartreuse. This was sweet, refreshing, had a tangy light kick, and wasn’t liquor heavy at all. And, last of the cocktails was the Old Dog, New Tricks that featured St. Georges Vodka, grapefruit, and was rimmed with grey salt and pink pepper. This was simple, refreshing, and more liquor-forward than the other drinks. The grapefruit balanced nicely with the vodka and cleansed the palate with each sip. We also tried some great glasses of wine from their extensive menu of 22 by the glass options.
. . . and then the appetizers started coming out. First up from the Snacks & Bites to Share part of the menu were the Heirloom Popped Corn and the Crispy “Duck Ribs.” The popcorn was pretty simple with just sea salt and black pepper sprinkled on top, but we liked how the kernels were approaching that smoky taste from being a bit over done. You know that in-between phase where the popcorn isn’t black, but it isn’t just popped? Kind of like a medium on a steak? Yeah, like that . . . which we actually like. And, then, we dug down deep into the duck ribs. Chef Lazlo prepares these with a warm and sense-awakening 5-spice blend and finishes it off with a honey glaze. Each rib was definitely crispy and oh so messy . . . the way ribs should be. The duck was cooked nicely, closer to the consistency of a meaty pork rib, and wasn’t very gamy at all. We’d definitely order these again. Just as we were finishing both of those up, our Farm Egg Flatbread came out. While there are five choices for flatbreads baked in their wood-burning oven, we couldn’t resist this one with Benton’s ham, two farm fresh eggs, and creamy mozzarella. In no way shape or form did we expect to come into Mill Street Bar + Table and fall deeply in love with a pizza, but we did here. The crust was crispy on the outside, fluffy inside, and had that nice give which played so well with all the ingredients. Our only problem, though, was deciding who would get the slices with the eggs. So, we divided the egg slices up, one per couple. See, we can share. We dreamt of this the next morning for breakfast. Ok, so this is where the madness began. 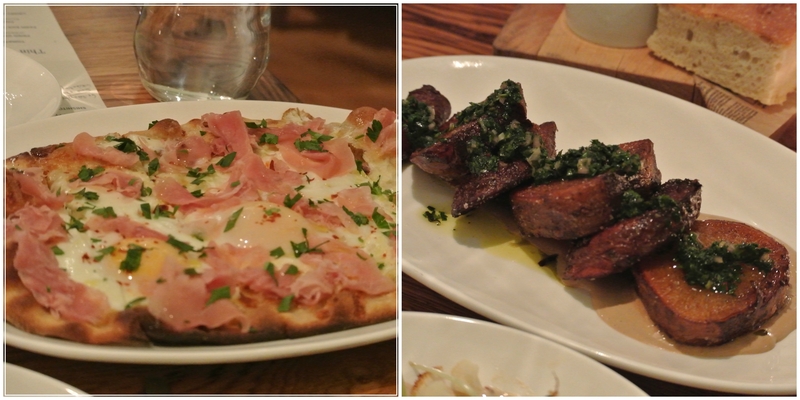 In addition to the other dishes that we ordered, the kitchen brought out a few dishes for us to try . . . and it just so happened to be dishes that we had our eyes on already. First up was the Roasted Cauliflower. Now, just a note here, many of the ingredients that you’ll see vegetable wise come straight from the Back 40 farm in Washington?, CT (the same farm that supplies their sister restaurant, Back 40 Kitchen). So, when we say things are fresh, yeah, they are so fresh. When the cauliflower came out, our server explained that they were cooked Medium (then brined overnight), as Chef recommends then left us with a steak knife for the florets. The cook on each cauliflower was perfect: not too chewy like you get when it’s raw, and not soggy like you get when it’s overcooked. Just right and just that perfect crunch. But, it wasn’t just cauliflower. There was a pine nut butter, capers, and lemon that provided a warm, briny, and toasty accent. We also tried the carrot fries, cut into thin curly and crispy ribbons. The fries were great and had a nice spice to them, echoing some Thai spices that are more pronounced in the Thai Curry Buttermilk Dressing. We also tried the Sweet Potatoes which got everyone at the table talking. There was a beautiful cook on the sliced potato, so much so that it gave way under a slight move of the fork. The black garlic aioli added a great, rich, dark accent to the dish and the herb salsa that was on top added a zingy and herby kick with a minty flavor in the forefront. After ALL THAT FOOD, our main dishes arrived. 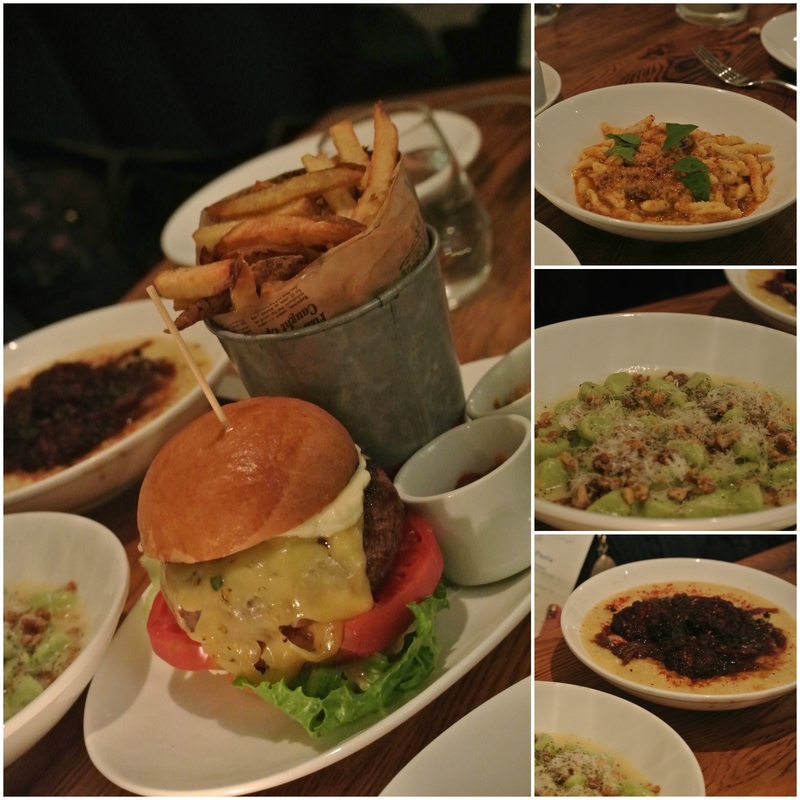 First up, John and Dan shared the Pastured Beef Burger and Ricotta Cavatelli. The freshly made cavatelli was served perfectly al dente with that nice give and chew. The sauce was a tad bit sweet and tangy, balancing nicely with the richness of the delicate crumbled beef. Speaking of beef, let’s talk about one of the best burgers we’ve had in a crazy long time. Before we do, those fries. They were nice and crispy on the outside, had nice give with each bite, and were salted just right. The burger itself was served a beautiful medium rare and was served with a housemade mustard, a light aioli, and cheddar, all served on a fluffy potato brioche bun. Each bite was a juicy burst of fresh flavor, definitely something we would order again and recommend if you love your patties. Kristien and Jen decided on the potato gnocchi and the pork meatballs. First off, the gnocchi was just so soft and delicate, contrasting nicely with the savory sage pesto, the crunchy walnuts, and sharp bite from the pecorino. It was like fall in one spectacular dish. And, where that pasta dish shined, the meatballs fell short. The thing is, we liked the creamy and slightly sweet polenta, and enjoyed the rich sauce made with sweet and tangy onions, but . . . but the meatballs weren’t right. Yes, they had that golden and crispy crust that was a bit overdone, but the inside was just too bland and ground meat-like. They weren’t terrible, but in comparison to everything else, the just didn’t shine. And, like that, it was time for dessert. Before we go further, we need to note and kind of gush over the Pastry Chef, Caryn Stabinsky. She has worked at elm in New Canaan, Oceana in NYC, Monkey Bar, and even wd-50. It’s safe to say after this meal that she’s moved to the top of our lists of favorites. 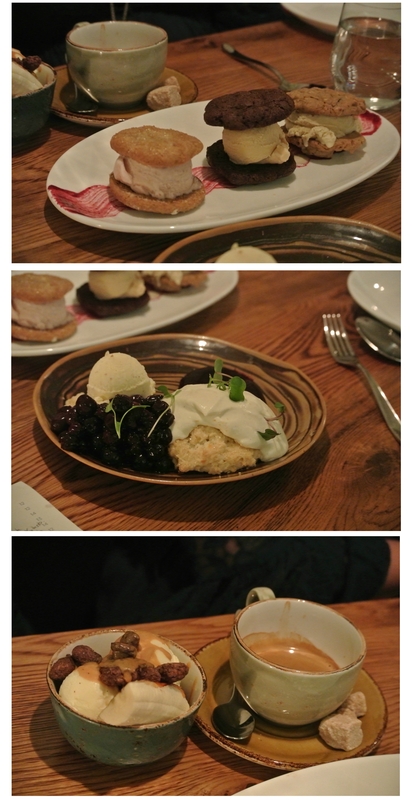 Well, the first of the desserts was the Blueberry Shortcake that featured corn in three ways: biscuit, cream, and even ice cream. The finishing touch was a fresh blueberry compote that was bursting with flavor. The biscuit was light and buttery and that ice cream? Killer! There was even this nice hint of smokiness to it. We also ordered the Dulce de Leche Sundae because, well, goat cheese ice cream. That was served in a bowl with a brûlée banana and a chocolate covered corn crunch. It all just worked out so well with the sweet and caramely goodness from the banana, the fatty gaminess from the ice cream, and the crackle of the corn crunch. And, we finished it all up with the Mini Ice Cream Sandwich Platter. Guess we like ice cream, huh? Well, like how we raved about the Milk + Cookies at Back 40 Kitchen, so we rave just as much for this dish. The first was a Tamarind Ginger Snap Cookie with Strawberry Ice Cream. This was a spicy and fun contrast with such a nicely baked cookie that was nice and chewy, even with the ice cream there. The next sandwich was Chocolate Chocolate chip Cookie with Peanut butter Ice Cream. This was probably our favorite, with a honey flavor coming through . . . probably some of the best PB IC we’ve had here in CT. And, we wrapped things up with the Oatmeal Sour Cherry Cookie that came with Vanilla. Again, the cookie was chewy, had that warm oatmeal flavor, and the cherries added a nice sweety tartness. Mill Street Bar + Table really has all the bases covered: whether you’re looking for some small bites, from fresh vegetables prepared in an exciting fashion, flatbreads, or bigger dishes like handmade pasta, seafood, and wood roasted meats, this will be one of your new favorite restaurants. Be ready to wait, though, for as big as the restaurant is, they’ve been packed since opening. And, after eating the hell out of the menu, we can say there’s good reason to. Unfortunately, there’s still so much on the menu for us to try, and so little time . . . especially because Chef Lazlo changes the menu often, actually printing new copies each night to make way for what’s fresh from the sea and farm. Congratulations to the Kings and Chef Lazlo on a successful opening and thank you to Michael, Breno, and the very helpful staff at Mill Street . . . we’ll be back . . . a few hundred times. Sounds awesome…How did the burger stack up against Coals in PortChester as that may be the region’s best burger? Glad to hear you found a great unpretentious seafood spot as they are sorely lacking in the area. Hey Jeff, so since the last time we had the burger at Coals we would say this is better. We do know they changed their burger since the last time we had it, so we need to try it again to see.